These Aurora SP1000 Shredder Sharpening and Lubrication Sheets are an easy way to help keep your shredder working optimally and prolong its life. Each sheet contains a natural grinding powder and when used regularly this helps to sharpen the cutting blades and keep them clean. In addition, each sheet has just the right amount of shredder oil to help keep the cutters well-greased and operating smoothly. There are 12 biodegradable sheets in every pack and as well as sharpening and lubricating the blades, using these oil sheets can help reduce noise, paper dust and help prevent rusting too. 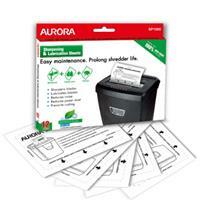 To use them, simply insert one complete sheet into your shredder as you would a normal sheet of paper. Once it is shredded, put the shredder into reverse for a short period to complete the process. Aurora recommend using a sheet at least once a month to maintain maximum shredder performance - or you can use one after every bin change. The Aurora SP 1000 Shredder Sharpening and Lubrication Sheets (Pack of 12) are compatible with all shredders that require oiling.